The cliffs at Reiff are well known in climbing circles and many people come to this area for the challenge - including the local mountain rescue team for exercises! The area offers an amazing array of steep sandstone seacliffs, many of which are non-tidal. The rock is compact and almost all the gear placements are sounds: lots of small nuts and friends. Several different areas, with walk-ins ranging from 5 minutes to an hour. 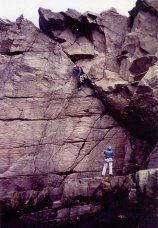 If you're keen on climbing cliffs, our house at Reiff would be your ideal base!